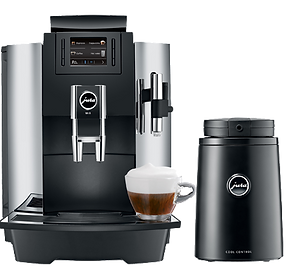 JURA WE8 Coffee machine & Milk Cooler. (Machinery for reception areas and meeting rooms). This machine is also perfect for reception areas and meeting rooms. Fresh whole bean coffee, ground to delivery everything from a cappuccino to a flat white and all with fresh milk.